The zombie apocalypse has started. As you make last minute preparations, the zombies begin wandering into your neighborhood. You and your opponents scramble into your houses in an effort to escape the zombie horde. But they know you’re in there. They aren’t going to give up that easily! Players take on the role of neighbors who have become trapped in their houses by hoardes of zombies. On your turn you try to improve your fortifications, gather weapons, and kill the zombies surrounding your house. Your plans are more nefarious than that however! You are also trying to out-last your neighbors and will even attempt to send the zombies their way to keep them off of your property! You may not survive the apocalypse, but you are going to make sure you are the last neighbor alive! 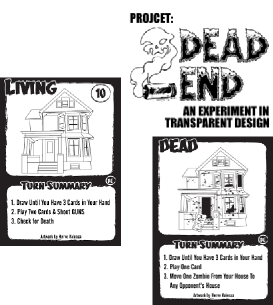 This is a fast-paced zombie game that is played with a deck of cards, a pair of dice, and some zombie tokens. My goal when I started this project was to make a zombie game that is actually fun to play. Most zombie games have slow-moving, boring zombies that are more tedious to deal with than they are imposing. Not in this game! Each and every zombie surrounding your house poses a threat as you struggle to remove them before they break down your doors. If you’d like to give it a try, I keep the file link on the left updated. It includes all the files you’ll need to print and play the game. I’m always looking for more playtesters and feedback! Dead End is the first game created in my Open Game Design experiment. I have written about the entire creation process on this site and will continue to do so as I wrap up the project and either release it as a print and play game or it is published.